I know, I know, we’ve been gone for a few weeks. Did you miss us? You can thank my work for an event the first Wednesday, and then one of our dogs for an impromptu visit to the emergency vet the following week. He’s fine, and I think faked his way through that visit just to be an “only dog” and have an evening alone with mom and dad. Because he’s awesome like that. I can also assure you that no place we will ever visit on a WTGW trip will rival that evening in terms of the bill at the end of the night. And if it does we better be far more hungover the next day. So I’m kind of hedging in on Shane’s “hole in the wall” category with this one. And he was bummed he missed this place for one of his picks. Well, at least he was before we went, when he thought it might be a diamond in the rough winner for top of the list. Sorry to ruin the surprise … but yeah, no. Since Teschner’s falls on the side of town closer to the highway than our house, it was just easier for me to meet the rest of the group there on my way home from work. I pulled into the tiny parking lot next to what I thought was Ted’s car and went inside fairly confident that I was the last to arrive. And then looked stupid when I proclaimed to the bartender that I was meeting people … who weren’t there yet. Oops. And I definitely wouldn’t have missed them if they were there, because once again I was in a space that rivaled the size of our living room. Apparently between this place and our last adventure (Frank’s) we’re cornering a market on the tiniest dining establishments in the area. Be glad we aren’t claustrophobic. So once I established that the people seated at any of the six available tables were not my husband and friends, I asked the bartender to go ahead and put us in for a table for four. She then asked me if I was sure I was in the right place. 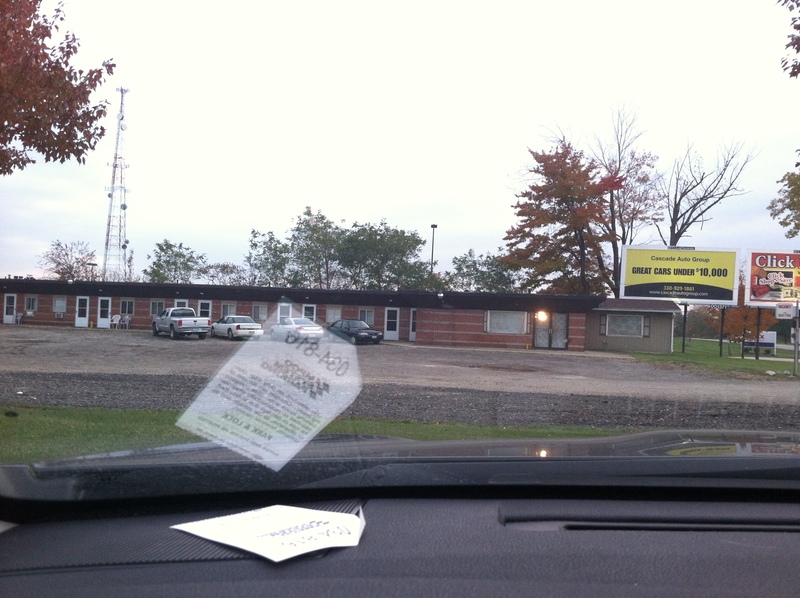 Well, yes, because, well, I could read the sign out front. But clearly I was a) new and b) overdressed in my work clothes. So thanks for that. She also started to tell me about the Long Island and other mixed drinks she could make, and I think was surprised when I chose an uncomplicated bottle of Miller Lite. See also: heels and scarves don’t make a girl high maintenance, thanks. So I grabbed a bar stool and my Miller Lite and waited for the rest of the group. Meanwhile the bartender snagged the “big table” when that party got up and held it for us. Again, I’m sensing a theme over the last few weeks. 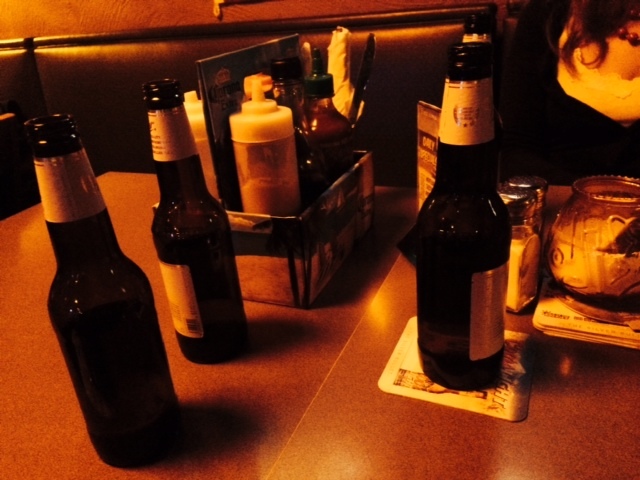 Upon arrival, Shane and Amanda also ordered Miller Lites. Because, well, that’s how we roll. Ted went for the Christmas Ale on round one, and then one of the other two craft beers on draft for round two. Because, well, that’s how Ted rolls. You all should really kind of know this by now. Mine and Amanda’s side of the table. Obviously. 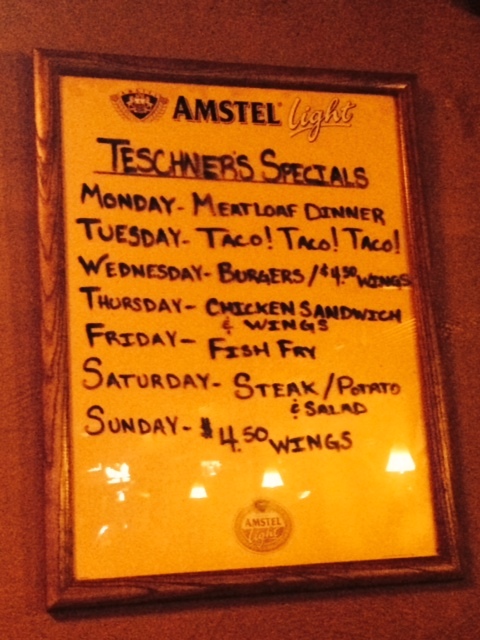 From what I’d seen online, Teschner’s is known for their burgers. And when we saw them coming out of the kitchen we realized why. They looked giant. And delicious. AND they’re $2.00 off on Wednesdays, so score. So that’s what Shane, Amanda and I all ordered. I had the BLT burger, which doesn’t come with cheese but I added cheddar and was glad I did. It was tasty. 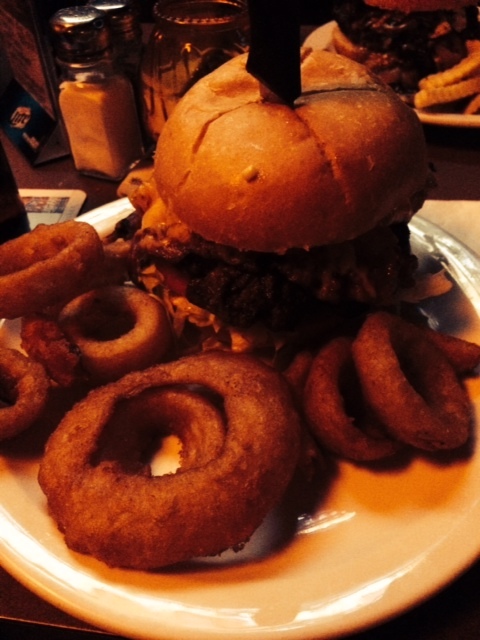 I’m not sure what part I actually enjoyed more – the burger or the bacon. I also went with a side of onion rings, which are beer battered and delicious at well. I was not disappointed. 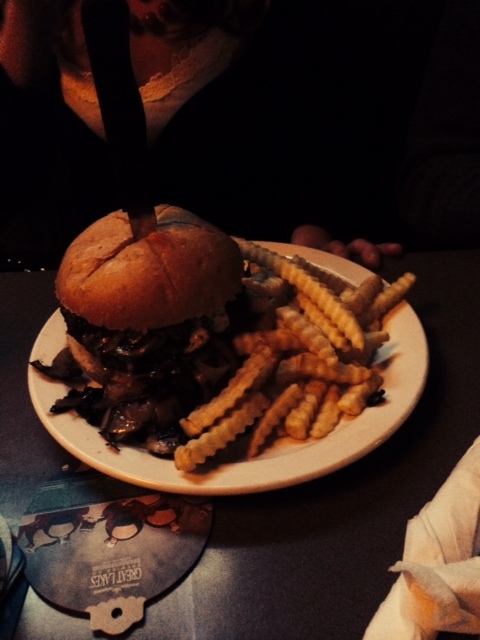 Amanda, however, had the burger with blue cheese, which she said was a bit overpowering. She also got the fries, because she thought would be fresh cut like fair fries. But when they came out as crinkle cut fries, she realized that was actually how they’re listed on the menu. Oops. Although in her defense, it’s really, really dark inside Teschner’s. Like if the TV hadn’t been on above us, we might not have been able to see our menus. Because a few candles on the tables, or even some festive-year-round white Christmas lights, would infringe on the “ambiance” too much? Thank God no one tuned the TV to a CSI marathon or we’d really been out of luck. Shane had the burger with a brandy sauce on it, which he wasn’t crazy about either. The burger patty itself was good, but the sauce made it not so much. So basically the takeaway here is go simple on the burgers. Skip the fancy sauces and gourmet cheese, and just make a really good cheeseburger. Which they do, but then ruin it with all the elaborate fixins. Boo. 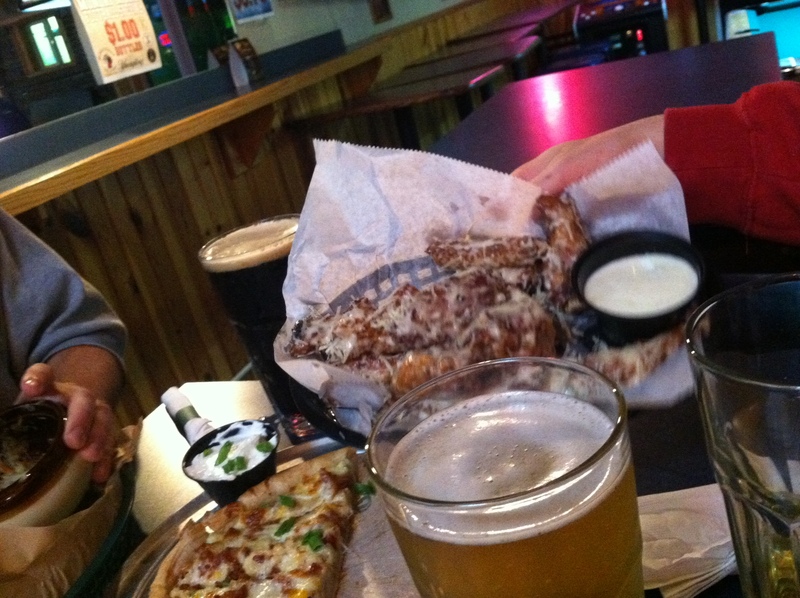 Because the other special on Wednesdays is 10 wings for $4.50, and, well, Shane likes to eat all his daily meals in one sitting, he also had 10 of the garlic wings as well. And garlic they certainly were. 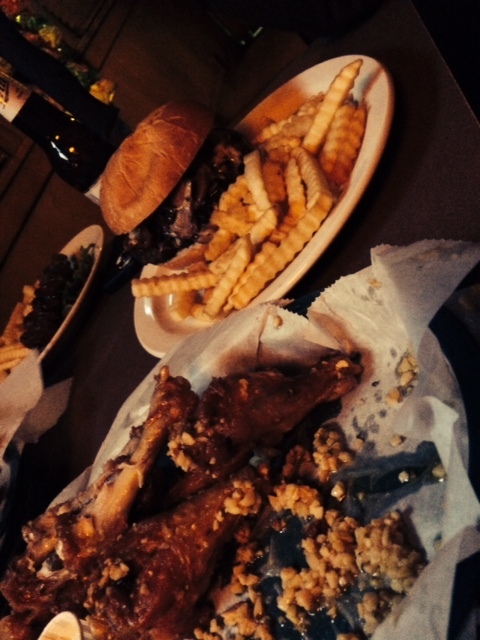 Let’s just say that no vampire was coming within a 50 mile radius of our group once those wings were placed on the table. Or probably anywhere near Shane for the forseeable future, as all that garlic oozes its way out of his pores. So, lucky me. Can I get some garlic up in here? 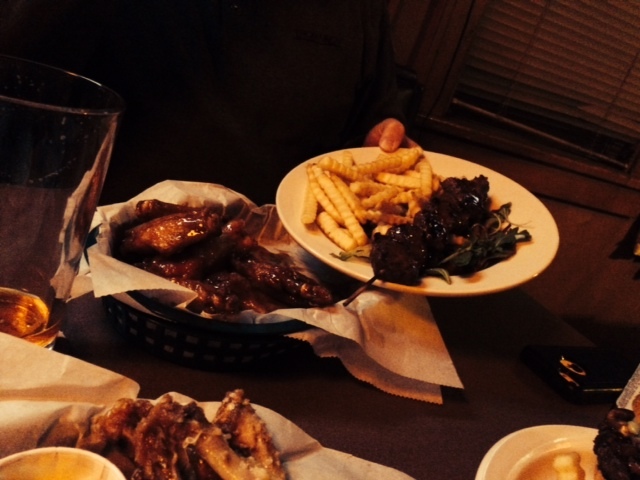 Ted also went with the wing special, along with sides of fries and steak-on-a-stick. If only those had been fair fries, he would’ve been reliving a summer day at the county fair over there on his side of the table. He made yummy noises all through eating the steak-on-a-stick, so he was clearly happy with it. And for like $4 how can you not be? He almost ordered another one just because. Our server – who was also the bartender, because, well, six tables – was pretty good to start off, but then we kind of lost her after the food was delivered. Sure, I get it, we’re not top priority once the orders are up and the true alcoholics/regulars are racking up tabs at the bar … but it seriously took about 20 minutes to even catch her attention enough to get the check at the end of the night. Which may be another point in the favor of extra lighting in the place. Just sayin. So all in all, Teschner’s wasn’t exactly the gem of a place that we were hoping for, or that we’ll necessarily go back to. Between the wierdly uncomfortable setup of the place (the restrooms are located in a hallway where I would think a front door would make more sense, and essentially back up to the bar, so you have to shimmy your way through a narrow passageway in order to get from the dining room side to the pool table/open mic night area), the lighting for those with eyes better than bats, and the strangely flavored burgers, we just weren’t overly impressed. Plus it’s just maybe a bit too much of a “regulars” hang out for those of us who can’t commit to that status. Oh well. Drinks: Only a few beers on draft and they were craft beers. Kind of surprising for a place that also serves PBR in cans, but whatevs. Food: Keep it simple stupid might be more of a rule to live by here. The burgers themselves were delicious, but the additions were just a bit over the top and not as well thought out flavor wise as they could’ve been. Service: Good at first, but then we kind of lost her at some point after the food was served. I think the “regulars” got more of her undivided attention. Overall: Eh. I think I had hopes of a Muskateer’s-esque environment, and this just fell short. That’s right, it’s time for a re-review of the hands down best find we’ve come across in all our WTGW adventures. So I have to admit I was a tiny bit disappointed that we arrived after dark this time and therefore didn’t get a chance to sample some of the stellar entertainment that we witnessed last time at the motel next door. There weren’t even many cars in the motel parking lot this time around. The holidays must be their off season. Muskateer’s, on the other hand, was hopping. The parking lot was full, and when we walked in we quickly realized 7:00 was apparently well past the prime time to get a seat in the bar area, because the place was packed. There were still tables in the dining area, though, so we were seated there. Full disclosure: despite the fact that really all that separates the dining area and the bar is some air and a bend in the wall, it makes a huge difference. I think all of us realized that the moment we were seated. It just didn’t have the same “fun” feeling in that area. And it’s not like it’s a whole different world – there are still a million TVs with sports on to watch, the walls are just as jam packed with sports and area memorabilia (again with the Applebee’s School of Interior Restaurant Design), the lighting is just as dim … but the atmosphere is just, well, different. 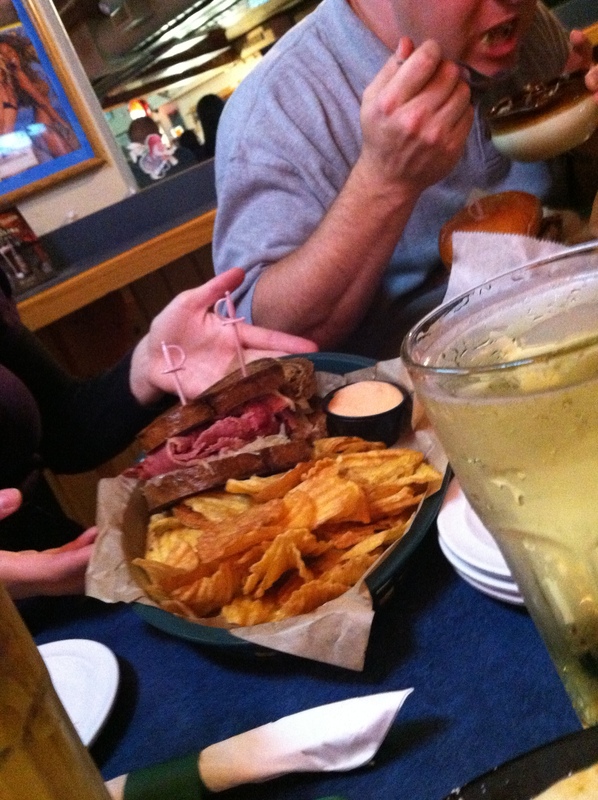 For one thing, the wait staff for the dining room can’t compare to the bartender we had the last time we were there. Hands down, that guy was just “on” – from knowing the extensive draft list from memory to getting our somewhat convaluded orders straight without writing them down to checking in on us at the right times while still managing the patrons at the bar – he was just all over a great server. With a great attitude. And maybe it’s an unfair comparison, and we’re giving this girl we had on Friday too tall of an order to fill, but she just wasn’t what we were expecting. We knew this from the very beginning, when Ted inquired about the draft list, and she looked puzzled before rattling off about half the number of taps we remember them having the last time we were there. Yikes. That being said, our return trip to Muskateers did provide one thing for which we may forever be grateful: it introduced us to McKenzie’s Hard Cider. And oh my word, we may never be the same again. Amanda, Shane and I ordered it on a whim – after hearing the words “hard cider” in a sea of “seasonal Christmas Ales” during the list of taps our waitress provided. It turns out that this particular one was their Seasonal Reserve, which is like hard cider with a touch of cinnamon and nutmeg. Or in other words, apple pie in a glass. Or in other words, delicious. The rest of the meal was relatively uneventful. 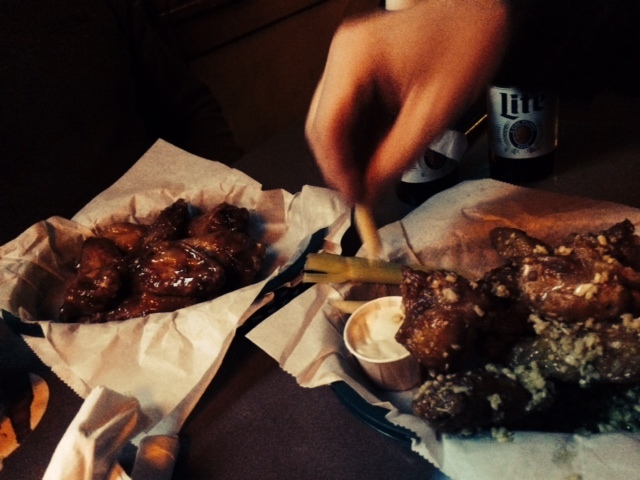 Since we were having the same drink, Amanda, Shane and I decided to keep the theme and all ordered the garlic parm wings – which were still as filling and delicious as the last time we were there. Shane also ordered a burger – because of course he did – which was very appropriately named the “Hellofvamess.” And that it was, with pretty much everything they cold find in the kitchen included on it (cheese, two or three varieties – check, bacon – check, cole salw – check, mayo and other condiments – check, sunny side up egg – check). I honestly don’t think I’ve ever seen anyone cut a burger into eighths and eat it with a fork, but that’s what my lovely husband did this evening. He’s dainty like that. 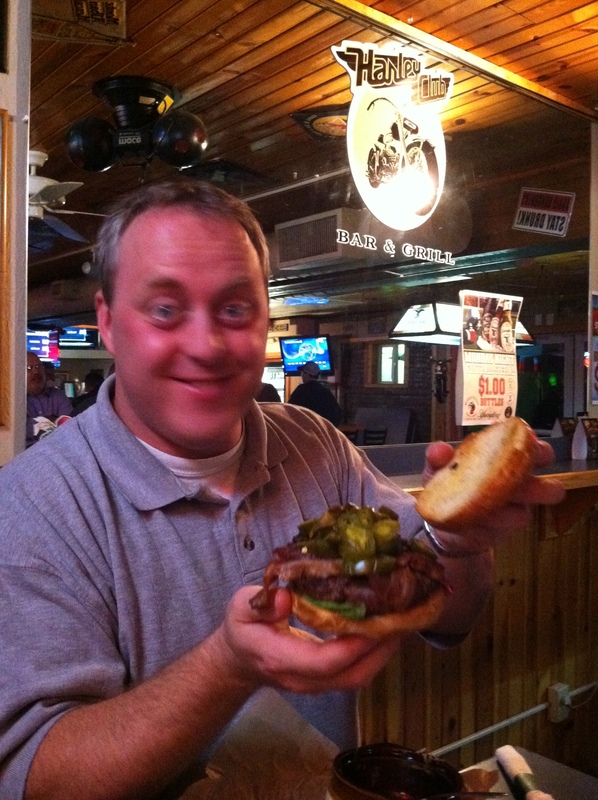 Ted ordered a burger, which was one of two that had jalepenos and may or may not have been the same one he ordered the last time , but who can tell when you ask them to leave off the cheese? Ha. All in all, even though this visit wasn’t exactly the glowing “ahh-haa” moment of our first time at Muskateer’s – it didn’t completely revolt us for future visits either. We’ll be back, for sure. I think this may become one of those “staples” where we’ll end up on a random night if we can’t think of anywhere else we want to head out to. Maybe we’ll even become regulars. 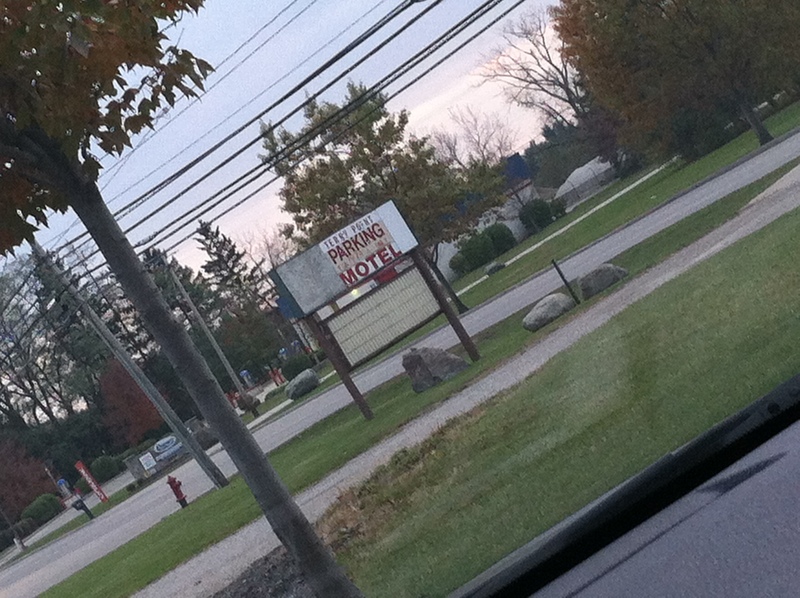 But I still refuse to go to an after party at the scary motel. No sir. 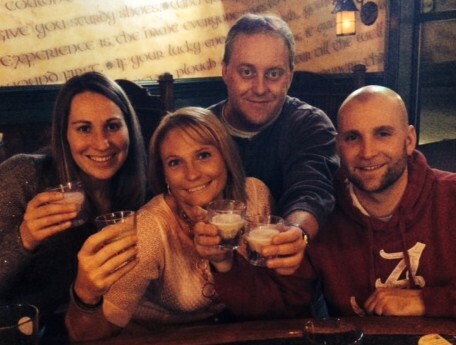 If ever there was a place that underscored the premise of Where To Go Wednesdays, it’s Muskateers Bar in Richfield. It’s one of those places everyone seems to know and totally rave about … but then you drive past it and have to do a double take because you’re certain that the unassuming building with no windows positioned next to the skeevy looking must-be-pay-by-the-hour-with-sheets-on-the-windows-as-curtains motel cannot possibly dish up the best burgers and wings in the area. Does that say Bates Motel? No? Not that I’m judging, because we totally did that exact same thing. And I’ll admit my image of the place kind of seemed confirmed when, after parking my car, I then spent the next 15 minutes completely entranced with watching a guy mosey over four different times to the dumpster located about 10 steps outside his motel room (did he ask for the end room for that reason? is it more expensive for the “dumpster view?”), each time reaching in and selecting a black, seemingly-not-empty back pack, and carrying it off into his motel room like a bag of groceries. Um, what now? It was like watching my own live episode of CSI. I was just hoping I wasn’t the poor person who gets killed off before the opening song. But anyway, believe me when I say that even if live-action dumpster diving documentaries don’t intrigue you, if you skip Muskateers just because of what’s next door then YOU’RE. MISSING. OUT. Seriously. Because, after 4 months of never visiting the same place twice, Muskateers just managed to elevate itself into the coveted position of “place we would gladly visit every single evening.” I wonder how much those rooms next door really rent for? First of all, the service was fabulous. We sat at a table in the bar area, which meant that the lone bartender was also our server. Sometimes this can be a recipe for disaster, but the young man working that evening as spot on. Not only was he able to rattle off the impressive tap list, he was able to remember our drink and food orders correctly without writing them down, came back often and at the right moments to get our refills, and was pleasant and smiling the whole time. Two thumbs up. And then the food. Fan-freaking-tastic. Just take a look. Those are wings underneath all that cheese. Say what? 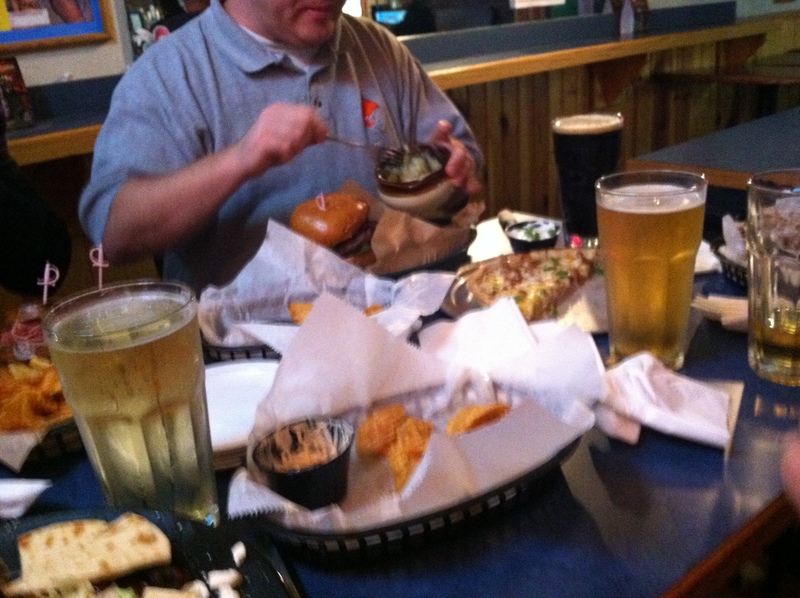 I think we ordered enough food to feed the entire bar – and that was just appetizers. How long can we do this before we all weigh 350 pounds each? Not to mention there was a random pizza sitting out on a table near the bar – which, when we asked our friendly bartender, he said that they put out a couple of pizzas at happy hour, and it’s kind of a free for all until they’re gone. Huh. We didn’t try any of it – because, seriously, have you seen the amount of food we ordered – but it’s nice to know if you get the happy hour munchies and don’t want a full meal, there are options. We fully intend to come back to this place on another night of the week – or on Browns away game Sundays – to make sure we have the same glowing experience. Hell, we may even become regulars – in which case we’ll have to start a new category on this blog just for all of our evenings there. Muskateers Mondays? It’s got a nice ring to it. Overall: I might not be kidding about that whole living in the motel next door thing. We’ll definitely be back.